December brings with it cooler temperatures and visits from old friends and extended family. This December in particular will be chalk full of some of Hip-Hop’s old friends and extended family. Actually it should be HUGE. Rumors have it that Eminem has a new album (possibly titled Empack) dropping. There has also been a leak of the track list for Jay-Z‘s Blueprint 3. On which Em is said to be contributing some work. Throw in Dr. Dre and 50 Cent into the mix and December 2008 will be looking more like December 2001. 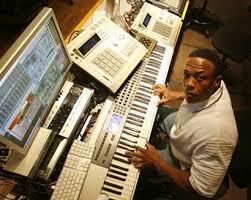 Detox, Dr. Dre‘s latest effort has been scheduled to be released for the last three or four years. Although there has not been a single released, or any sort of promotion through the normal channels, we here at eargoggles are sure that Dre’s work will be leaked soon. The album being put out by the ever-bulletprooft 50 Cent will almost assuredly disappoint. 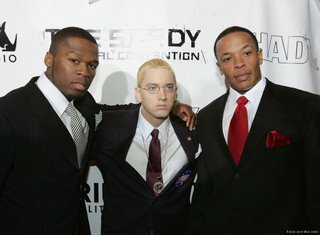 While the album may sell millions, the art will be comprimised once again and the dullards will eat up the mumbling Hip-Pop that Fiddy is known for. Furthering the demise of the art of Rap and Hip-Hop with the mass-pop and keeping the underground, or otherground, Hip-Hop scene shackled to good ‘ol self-promotion.